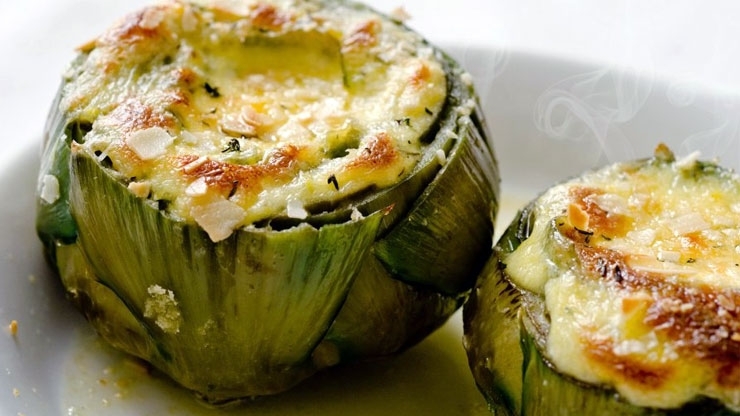 Today we’re gonna prepare stuffed artichokes. Basically it’s an artichoke soup with cacio e ovo stuffing based with bread and eggs. Trim artichokes, snap off hard outside leaves, cut off top inch or so of pointy tips. Cut off the stems, peel and cut them into pieces. Cook them in a broth. Put stem end down and press on open end to force leaves open. Use your hands to expand that opening, then use a spoon to scrape out choke. As you finish with each artichoke, sprinkle it with lemon juice and set aside. In a bowl, combine bread crumbs with pecorino, Parmigiano Reggiano (if you want, you can use only Parmigiano Reggiano), garlic, black pepper, basil, eggs. Stuff a portion of this into cavity of each artichoke, spreading some between leaves as well. Put the artichokes in the vegetable stock bowl for 20 minutes. Serve hot, warm or at room temperature.